Within George Washington's Mount Vernon's collection are many objects from France. In fact, many of these items can be found on display within the Mansion. This large iron key was salvaged from the storming of the notorious Bastille prison on July 14, 1789, and sent to Washington, together with a drawing of the ruined prison, by the Marquis de Lafayette, who was serving as commander of the Paris National Guard at the time of the incident. Lafayette’s letter presenting the key emphasized both his affection and his admiration for Washington: "Give me leave, My dear General to present you with a picture of the Bastille, just as it looked a few days after I Had ordered its demolition, with the Main Kea [key] of the fortress of despotism—it is a tribute Which I owe as A Son to My Adoptive father, as an aid de Camp to My General, as a Missionary of liberty to its patriarch." (Lafayette to GW, March 17, 1790). Washington received the drawing and the key in August 1790, during his first term as president, and described it as a "token of victory by Liberty over Despotism" (GW to Lafayette, August 11, 1790). He displayed it in the president’s house in Philadelphia and then at Mount Vernon, hung in an elegant carved and gilded display case, probably custom-made in Philadelphia. 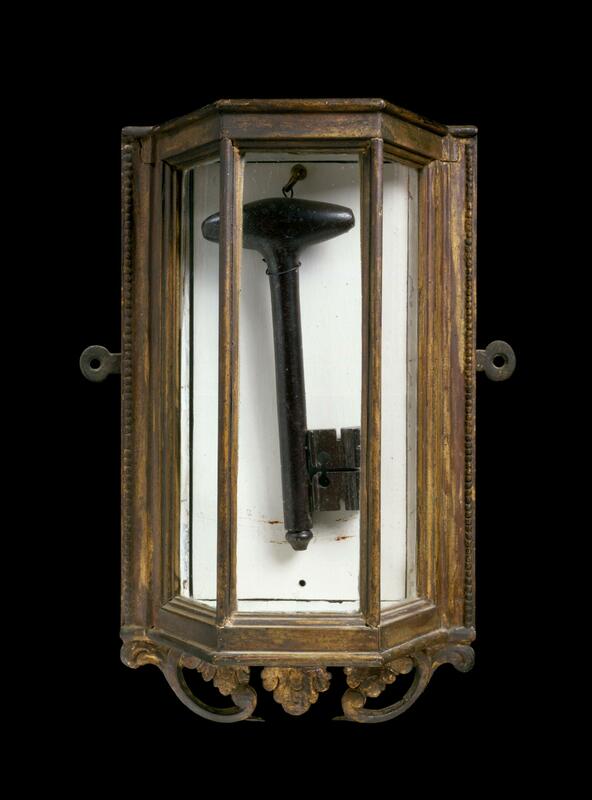 The key and its case remained in the Mansion when it was sold to the Mount Vernon Ladies’ Association in 1860, and they continue to be displayed in the Central Passage, where they hung in the Washingtons’ time. The Bastille key has left Mount Vernon only once since its arrival: from July 14-20, 1989, it was loaned to the Opera Bastille for a special exhibition marking the bicentennial of the fall of the Bastille and the beginning of the French Revolution. The drawing of the Bastille that hangs today in the Central Passage is a modern copy, drawn by Gloria Kamen; the original drawing, by French architect Etienne-Louis-Denis Cathala, remained in the Washington family until 1891, when it was sold at auction; it is now in a private collection on loan to Mount Vernon. Key and case: Transferred to the Mount Vernon Ladies' Association through the generosity of John Augustine Washington III, 1860 (W-14/A-B). George Washington (1732-1799) by Jean-Antoine Houdon, Transferred to the Mount Vernon Ladies' Association through the generosity of John Augustine Washington III, 1860 (W-369). 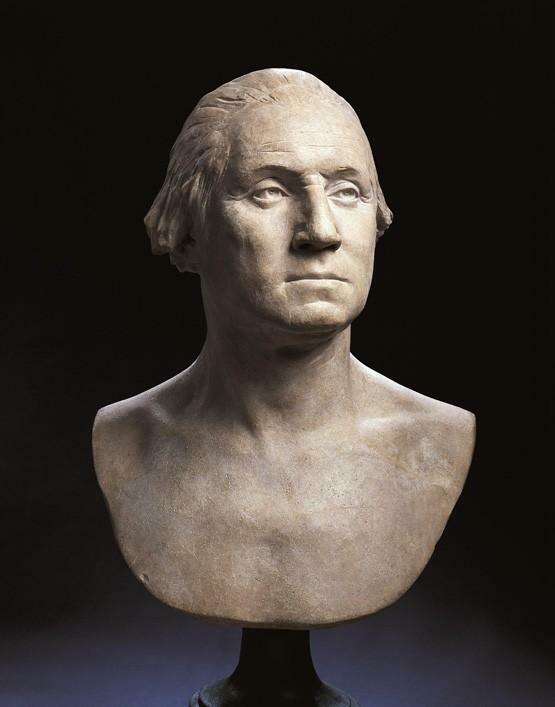 Houdon’s clay bust, considered one of the most accurate and expressive likenesses of Washington, was created from life during a two-week visit by the sculptor to Mount Vernon in the fall of 1785. This visit marked Houdon’s initial work in creating a full-length statue of Washington, commissioned by the Commonwealth of Virginia for its capitol building in Richmond, on the recommendation of Thomas Jefferson. Like the key to the Bastille, Houdon’s original clay bust remained in the Mansion after the Washingtons’ deaths; it came to the Mount Vernon Ladies’ Association when the MVLA purchased the property in 1860. The original is now on display in Mount Vernon’s museum galleries, which provide a more stable environment to ensure its long-term preservation; it is represented in the Study by a modern plaster copy (located over the door to the small closet on the land side of the room). Original bust: Transferred to the Mount Vernon Ladies' Association through the generosity of John Augustine Washington III, 1860 (W-369). Portrait of Washington at Verplanck's Point, New York, 1782, Reviewing the French Troops after the Victory at Yorktown, by Adrian Lamb after John Trumbull, Purchase, 1982 (M-2832). This small but vivid portrait celebrates a memorable moment in the Franco-American alliance during the American Revolutionary War. The artist, John Trumbull, depicts General Washington, graceful and relaxed, on a hill overlooking the Continental army encampment at Verplanck's Point, New York. The occasion is the grand review of General Rochambeau’s French troops, as they rejoined the American army, encamped on the Hudson River above New York City in September 1782, nearly a year after the decisive allied victory over the British at Yorktown. 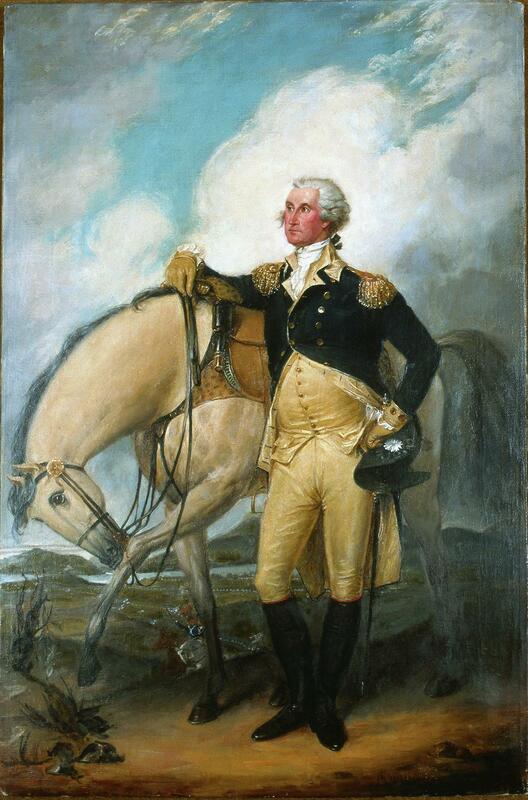 The original oil painting was a gift from the artist to Mrs. Washington, in 1790, in appreciation for her assistance in persuading the president to pose. It hung initially in the president’s house in Philadelphia and then in the New Room, at Mount Vernon. The original canvas descended in the family of Martha Washington’s eldest granddaughter, Eliza Parke Custis Law and is owned today by the Winterthur Museum. It is represented in the New Room today by a modern copy. 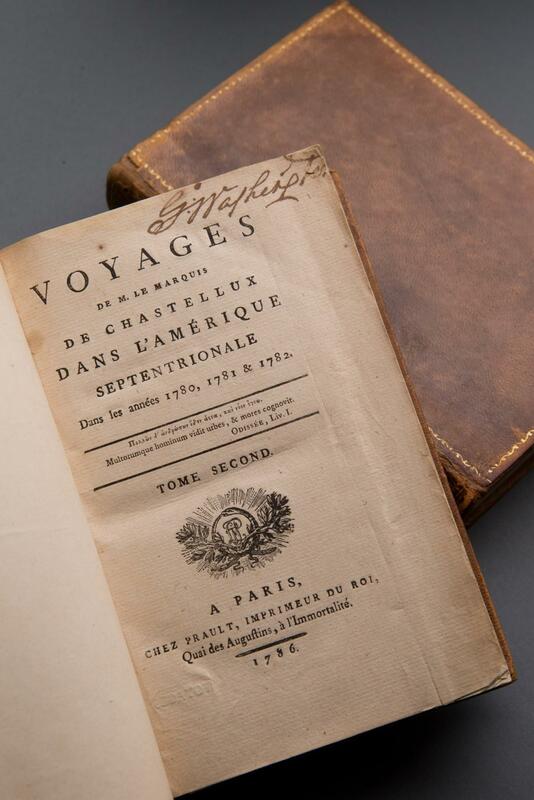 George Washington's copies of Chastellux's Voyages…dans l’Amerique in the collection of the Washington Library at Mount Vernon. François-Jean de Beauvoir, chevalier de Chastellux was born in Paris, France in 1734. He began his military career at a young age as a second lieutenant during the Seven Years’ War and rose to the rank of major general. He later served under Rochambeau, commander of the French expeditionary force sent to aid the Continental Army during the American War of Independence. He arrived in America in July 1780. After successful participation in the Yorktown campaign, he remained in America for over a year. He returned to France in January 1783; where he was made a Marshall of France and named Inspector General of Infantry. In 1784, he succeeded his brother as the Marquis de Chastellux. During Chastellux’s time in America, he became a close friend to Washington and they maintained this friendship until Chastellux's death. Having immense respect for Washington, in 1780-1782 Chastellux commissioned Charles Wilson Peale to paint a portrait of him commemorating the victory at Yorktown. And, in April 1786 he published Voyages de M. le Marquis de Chastellux dans l’Amérique Septentrionale Dans les Années 1780, 1781 & 1782 (Travels in North America), a book on his experiences in America including a description of Washington in which he stated that “the strongest characteristic of this respectable man is the perfect union with reigns between the physical and moral qualities which compose the individual…” In August 1786, Chastellux presented a French-language copy to Washington who then purchased the English translation in August 1787. The Washington Library is home to both of these editions. Writing table, c. 1788, Purchase, 1939 (W-220). Mrs. Washington’s mahogany, Louis XVI-style writing desk was another of the elegant French furnishings that the Washingtons acquired, using personal funds, in early 1790 from the household of the recalled French minister, the Comte de Moustier. Called “un bonheur du jour” or “daytime delight,” this popular form, designed explicitly for ladies, had been introduced in France around 1760. This example is stamped by master êbêniste (cabinetmaker) Victor-Jean-Gabriel Chavigneau (1746-1806). Made in Paris, it was brought to New York by Moustier in 1788, for the use of his sister-in-law and official hostess, Anne Flore Millet, Marquise de Brêhan (1749-1826). 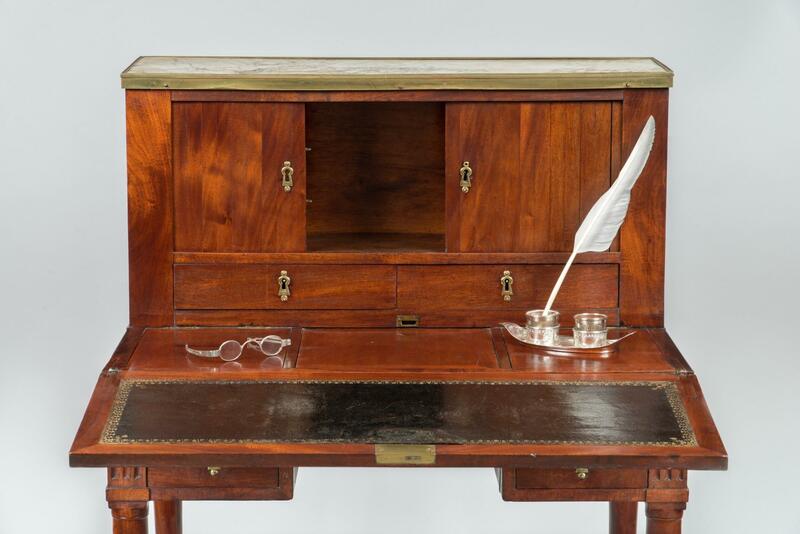 Martha Washington bequeathed the desk to her granddaughter, Martha Parke Custis Peter, whose descendants preserved it until it returned to Mount Vernon. Notably, the only two known, surviving letters written by George to Martha Washington were found in this desk, caught behind a drawer. The vivid white-on-blue wallpaper in the Blue Room is a custom reproduction, by Adelphi Paper Hangings, of a 1790s pattern, “Fleurettes, oiseaux, insects,” originally created by the Réveillon/Jacquemart et Bénard firm, Paris. Preserved in the firm’s historic pattern books at the Musêe des Arts Décoratifs, Paris, the design features graceful arcs of flowers accented by tiny, whimsical birds and insects. This selection represents the Washingtons’ updates to the Mansion in 1797, including wallpapering and painting throughout the house. The Philadelphia suppliers whom Washington patronized – William Poyntell and Georges Bertault – both specialized in highly fashionable French papers, and fragments of a Réveillon/Jacquemart et Bénard border were found in early restorations of the New Room. View on the River Po (published in London, 1782). Purchased by the Regent in memory of The President and CEO's late parents, 2011 (M-4966). The Musical Shepherdess (published in London, 1782). Collection of R.T.H.Halsey. Purchase, 1936 (M-93/E). 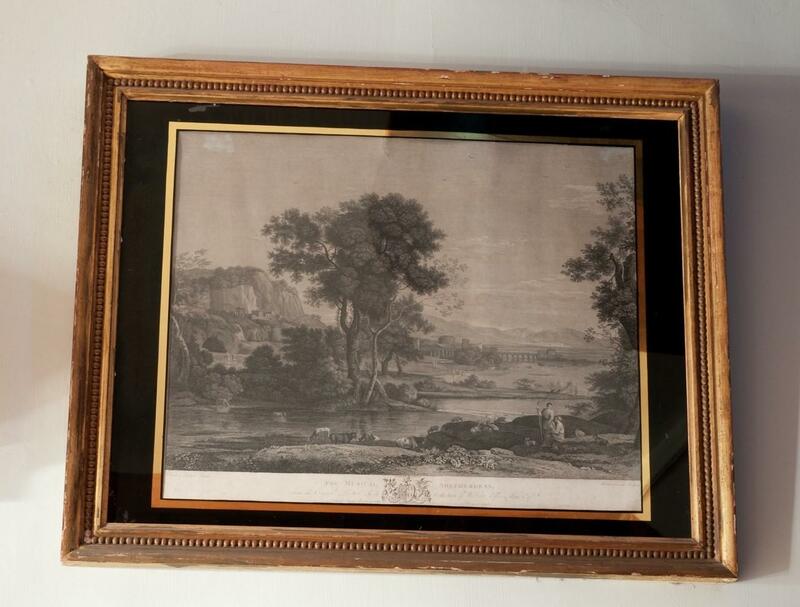 Four of the landscape prints displayed in the Central Passage are engravings after works by the celebrated 17th-century French artist, Claude Lorrain (ca. 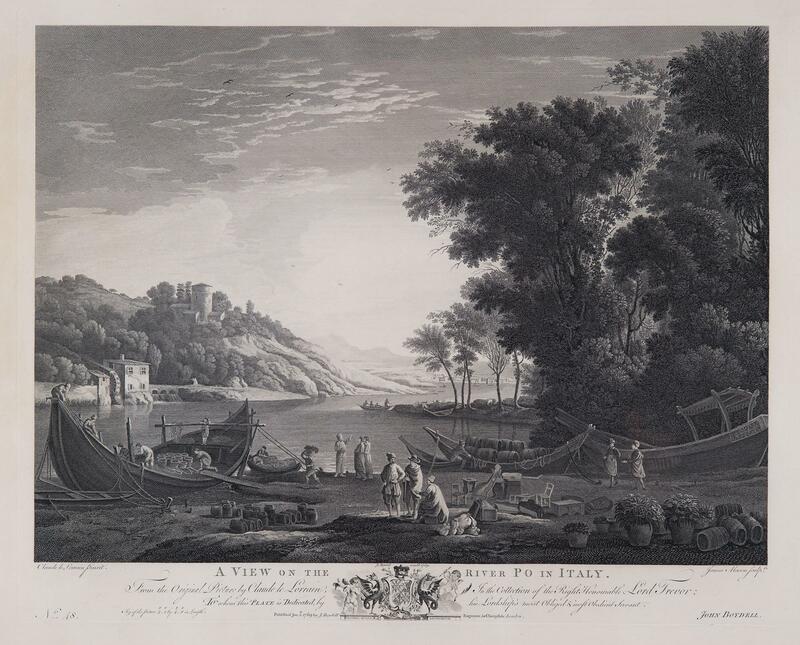 1604-1682): Evening, The Musical Shepherdess, Constantine’s Arch, and View on the River Po. These prints were part of a large group of nearly five dozen prints that Washington purchased at the end of his presidency in 1797, for the purposes of updating the interiors at Mount Vernon. At his death in 1799, the Central Passage featured an impressive display of three pairs of large, gilt-framed fine art prints, after landscapes by the celebrated Old Master, Claude Lorrain. Born at the beginning of the 17th century in the northeastern French duchy of Lorraine, Claude (as he is commonly known) was celebrated for idealized pastoral landscapes that featured dramatic effects of light and shadow and often included classical buildings or ruins. 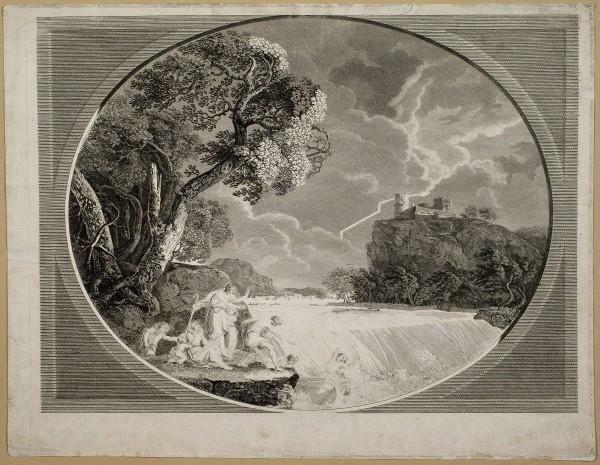 Engravings and paintings inspired by Claudian landscapes were highly popular in 18th century Virginia gentry households; Washington’s interest in such works dated back to his bachelor days, when he had acquired from London a “Neat Landscape – after Claude Lorrain” for the chimney breast in the Front Parlor. Silverplate bottle slider, c. 1783-1784, Purchased with funds provided by the Ammerman Family Foundation in memory of Bruce Ammerman, 2008 (W-2553). In the fall of 1783, as George Washington awaited news of the Peace of Paris—the set of treaties ending hostilities between the United States and its French and Spanish allies—he also devoted attention to updating the furnishings of Mount Vernon for his fondly anticipated return to civilian life. Like many Americans, Washington was eager to acquire fashionable French goods, newly available through direct trade. 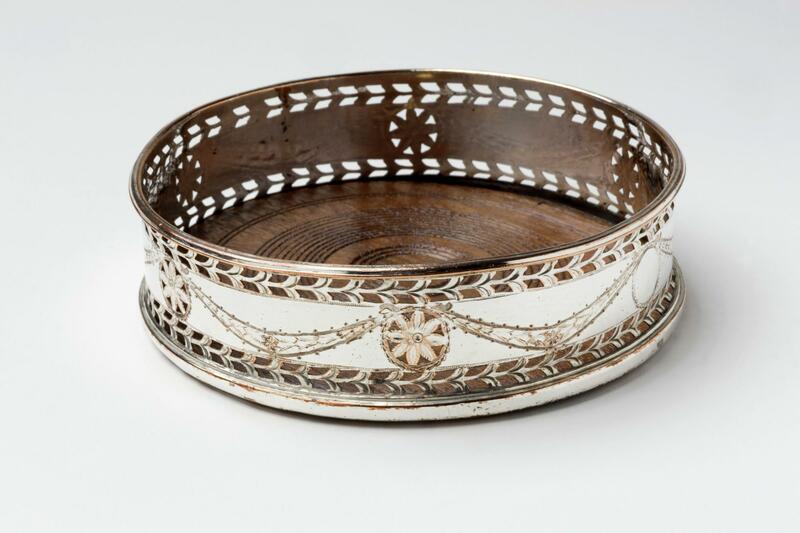 The general requested that his friend and former aide, the Marquis de Lafayette, procure for him in France an extensive assemblage of silverplate for tea table and dinner service, including salvers, hot water urn, tea pots, coffee pot, bread baskets, candlesticks, and “bottle sliders” (coasters). This bottle slider is believed to have been among the items selected by Lafayette and received by Washington in the spring of 1784. It descended in the family of Martha Washington’s oldest granddaughter, Eliza Parke Custis Law. Purchased with funds provided by the Ammerman Family Foundation in memory of Bruce Ammerman, 2008 (W-2553). 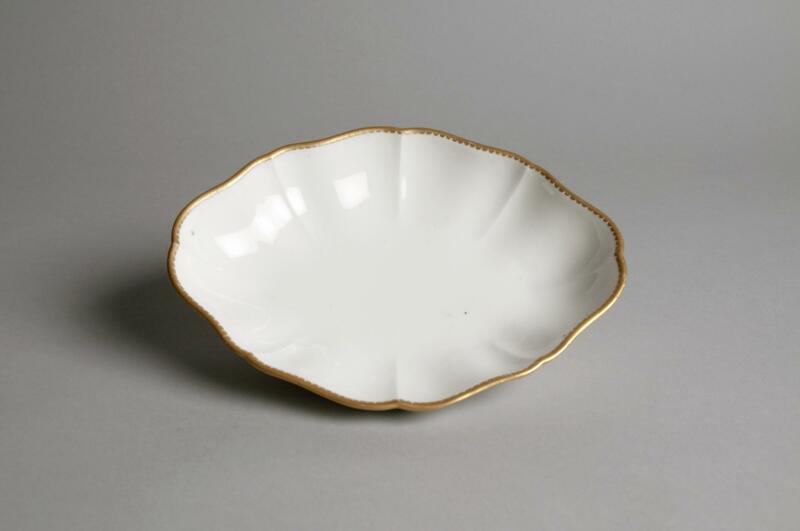 Serving dish, c1772-1788, Purchased, 1956 (W-2123). 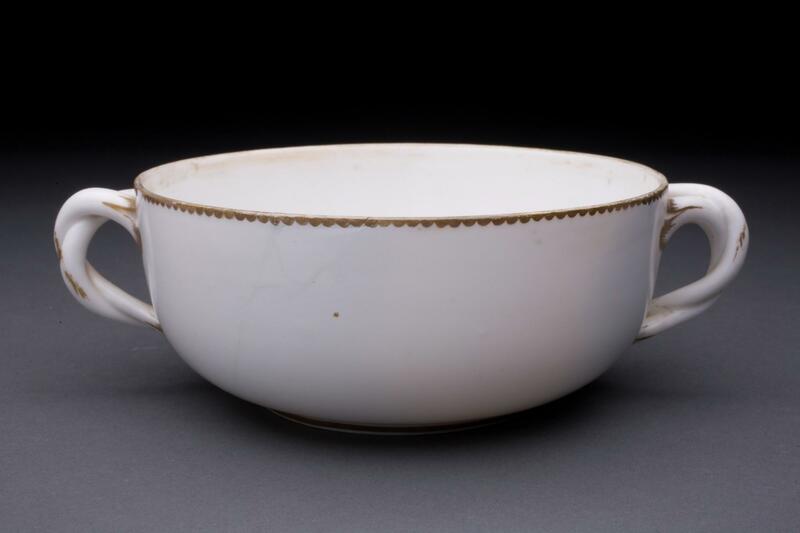 Two-handled bowl, 1778, Bequest of Harriet Hyatt Mayor, 1940 (W-1153). The dining table is set with gilt-edged white porcelain plates and serving dishes, part of the 309-piece china service that President Washington purchased, with his personal funds, in the spring of 1790, from the household of the departing French minister Éléonor-François-Elie, Comte du Moustier. Brought directly from Paris in 1787, the service included specialized forms for the polite service of dinner, dessert, coffee, and tea, assembled from the output of three French porcelain manufactories—Sèvres, Angoulême, and Nast. The service was used first at Moustier’s residence, a large mansion that Washington subsequently rented to become the second president’s house in New York City. There, the French porcelain graced the table at Washington’s weekly Wednesday afternoon dinners, impressing American government officials and foreign ministers alike with the dignity and taste of the fledgling nation. For contemporary diners, the restrained but elegant neoclassical aesthetic evoked not only the historically important French-American alliance, but more subtly, ancient white marble statuary and republican ideals. The Washingtons brought the service back with them to Mount Vernon in 1797, and continued to use it for formal dinners and the high-ranking guests who visited the retired president. Pieces from the service were preserved in the families of Martha Washington’s granddaughters, Eliza Parke Custis Law, Martha Parke Custis Peter, and Eleanor (Nelly) Parke Custis Lewis, and more than six dozen pieces have now returned to Mount Vernon. John Paul Jones (1747-1792), by Jean-Antoine Houdon, Gift of the Boston Museum of Fine Arts, 1945 (M-1432). In September 1779 the American naval captain John Paul Jones, commanding a small French ship renamed the Bonhomme Richard, defeated the much larger British frigate HMS Serapis, in a fierce battle off the coast of Yorkshire, England. The victory made Jones an international hero, and he was enthusiastically celebrated when he arrived in Paris in 1780. 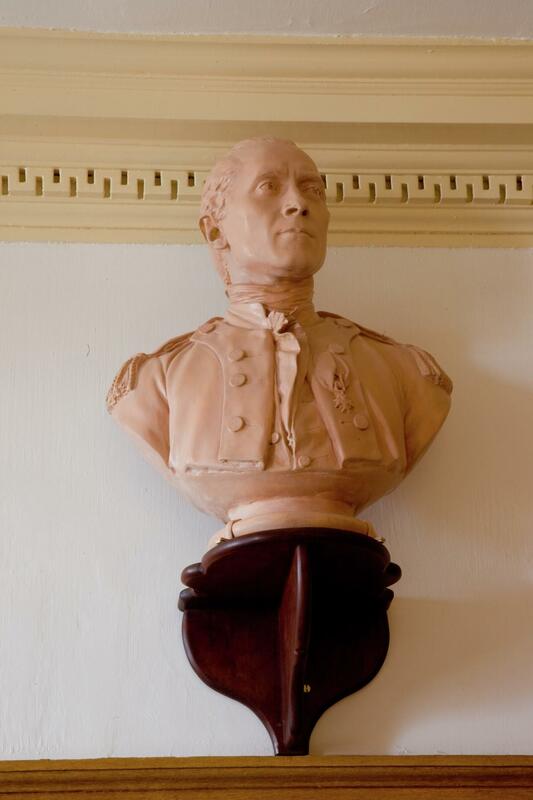 The prestigious Masonic Lodge of the Nine Sisters (La Loge de Neuf Soeurs) in 1780 commissioned Houdon to sculpt a bust of Jones, proudly wearing the Cross of the Order of Military Merit (Institution du Mérite Militaire) presented to him by King Louis XVI in 1780. Washington’s original bust of Jones was destroyed in an 1871 fire in Alexandria, VA, and is represented at Mount Vernon today by a copy cast in 1945 by Caproni Galleries, Boston, MA, from the original bust owned by Thomas Jefferson, in the collection of the Museum of Fine Arts, Boston. Gift of the Boston Museum of Fine Arts, 1945 (M-1432). 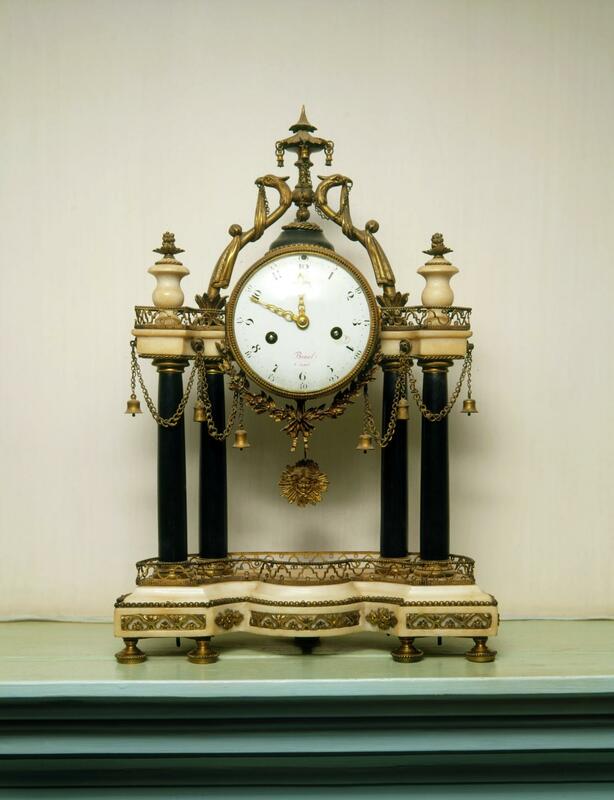 French mantel clock, c. 1788, Gift of Mrs. George W. Woodward, Vice Regent for Kentucky, 1890 (W-11). George Washington acquired this elegant Louis XVI-style mantel clock sometime between 1791 and 1794. Made in Paris, it features four black columns and an array of decorative ormolu (gilded brass) mounts, including a Chinoiserie finial, griffin heads, fringed draperies, fruits, laurel branches joined by a bowknot, and a pendulum with a radiant face of Apollo, the sun god. It is one of the most expensive individual items listed in both George and Martha Washingtons' estate inventories, valued at $100, and it was preserved in the family of George Washington’s sister, Elizabeth (Betty) Washington Lewis (1733-1797). Gift of Mrs. George W. Woodward, Vice Regent for Kentucky, 1890 (W-11). 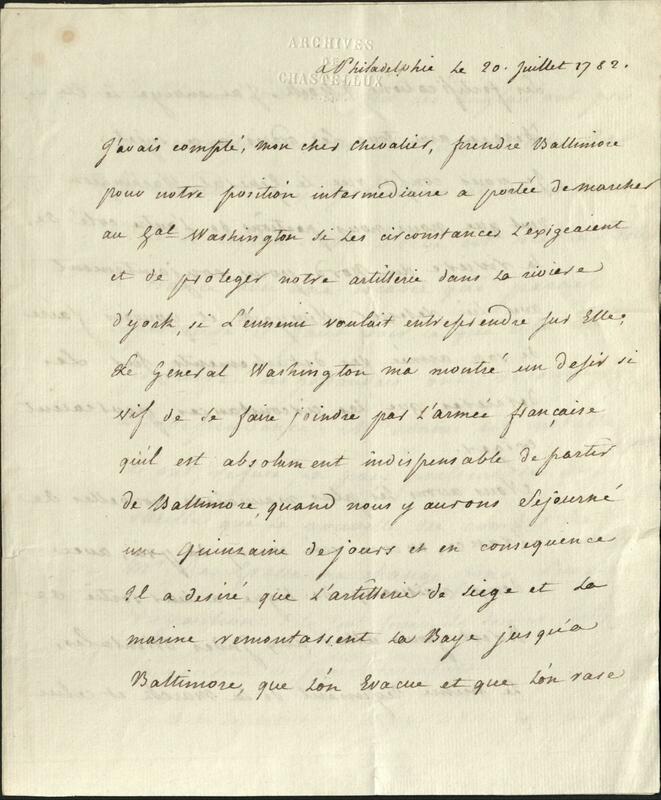 Jean Baptiste Donatien de Vimeur, Count de Rochambeau, Philadelphia, to Francois-Jean de Beauvoir, Chevalier de Chastellux, 20 July 1782, Purchased by the David M. Rubenstein Rare Books and Manuscripts Endowment, 2018 (2018-SC-019-003). Although Cornwallis’s surrender following the Siege of Yorktown on October 19, 1781 effectively ended the Revolutionary War, it was not until September 3, 1783 that the Treaty of Paris was signed. In the meantime, Washington remained vigilant and spent the winter following Yorktown planning for the 1782 campaign season. Rochambeau discusses some of these plans in a letter written to Chastellux, whom he had left in charge of the French forces in Virginia. The French troops are to march north to Baltimore, where they will stay for a few weeks until continuing the march to New York, where they will help Washington secure his positions there, should fighting break out again. The Mount Vernon Ladies’ Association acquired this letter, previously kept in the Chastellux family archives in France, in early 2018. Purchased by the David M. Rubenstein Rare Books and Manuscripts Endowment, 2018 (2018-SC-019-003). Sterne Conducting Maria into Moulines (published in London, 1786) Gift of Sarah Howard Caldwell, 1959 (W-2254). The Act of Charity (published in London, 1789) Purchase with partial funds provided by Mrs. Douglas Williams, Vice Regent for New York, 1976 (W-2720). 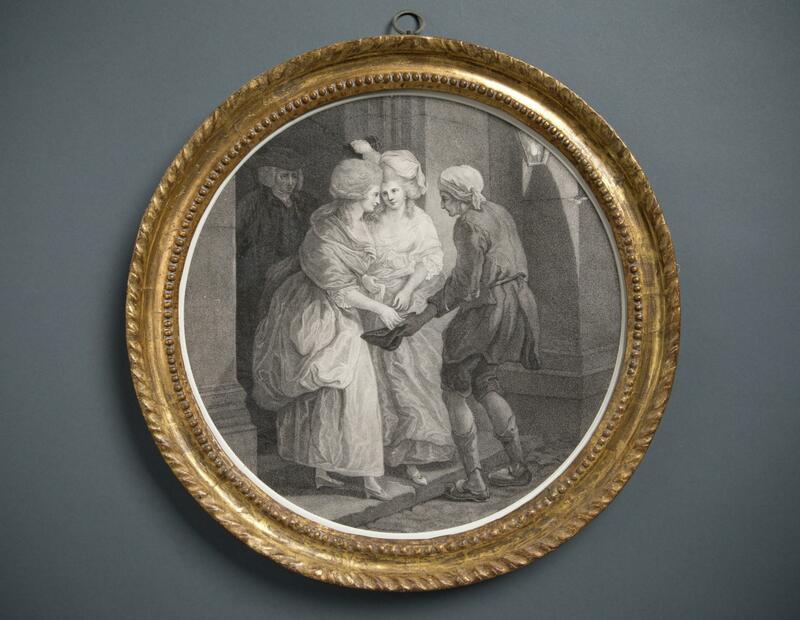 The prints in the Washingtons’ bedchamber include two scenes from Laurence Sterne's A Sentimental Journey Through France and Italy, an immensely popular travel narrative, first published in 1768. Drawing up Sterne’s own travel experiences, the best-selling novel follows its narrator from Calais to Paris to Lyon. George Washington purchased a copy of A Sentimental Journey in 1786, and the presence of the two prints in the bedchamber suggests that it may have been a favorite of Martha’s. Notably, the Washingtons always referred to this room as “Mrs. Washington’s Chamber.” One of the prints, The Act of Charity, is the work of the French-born printmaker, Jean-Marie Delattre (1745-1840), active in London. The original prints, on display in the bedchamber, descended in their original gilt frames in the family of John Augustine Washington III, the last family owner of Mount Vernon. Jacques Necker (1732-1804), by Louis-Simon Bouzot, 1789-1790, Purchase, 1969 (W-2548). The bust displayed over the door to the piazza is made of biscuit (unglazed) porcelain, created at the Sèvres manufactory in Paris by Bouzot (1743-1809), the director of the Sèvres sculpture studio. 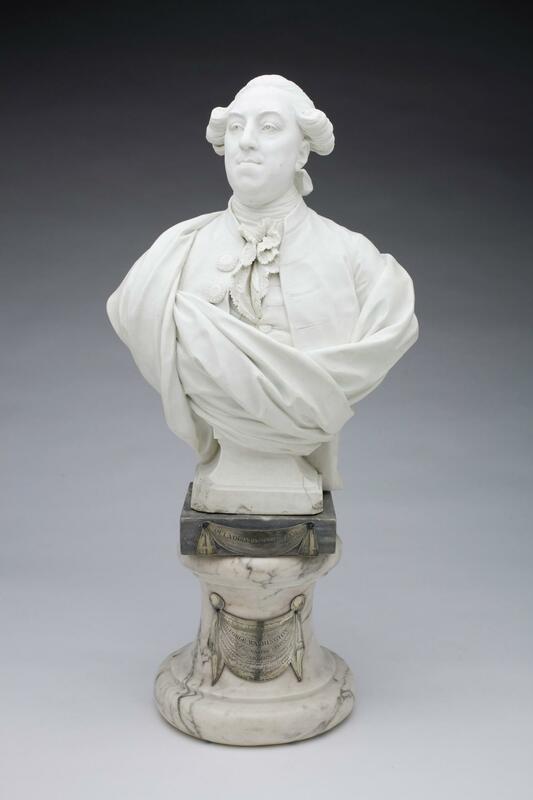 The bust depicts Jacques Necker (1732-1804), who served as finance minister of France from 1777 to 1781 and supported France’s alliance with the American revolutionaries against England. The bust was presented to George Washington in 1790 by Charles-Hector, Comte d'Estaing (1729-1794), a French admiral who had commanded a fleet sent to aid the Americans, laying siege (unsuccessfully) to Newport, RI, in 1778 and Savannah, GA, in 1779. After George and Martha Washingtons’ deaths, the bust remained in the Washington family until 1891, when it was sold at auction to the Pennsylvania Historical Society. It returned to Mount Vernon in 1969. Quay, Italian City, after Claude Lorrain, ca. 1700, Purchase, 1954 (M-1959/A-C). 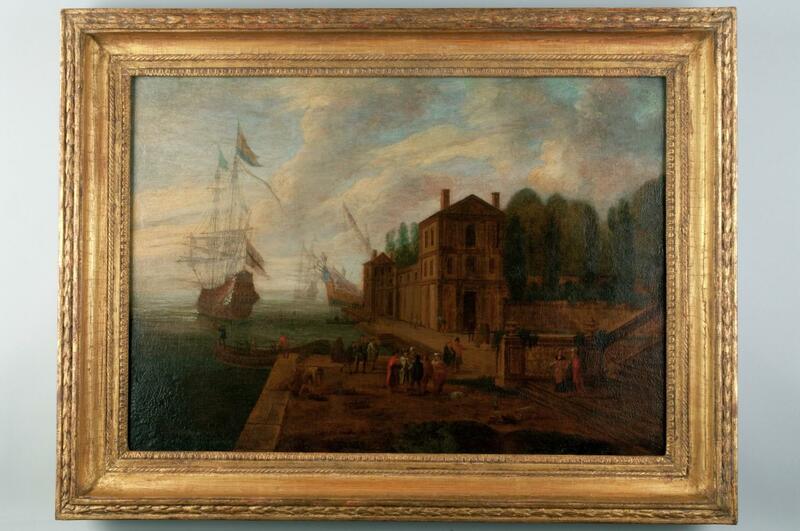 The oil painting over the mantel in the Little Parlor depicts an early morning scene along the docks of an Italian city, rendered in the style of the renowned 17th-century French landscape painter, Claude Lorrain. An early inscription on the back of the painting suggests that it may have been a gift to Washington from Jean-Baptiste Donatien de Vimeur, comte de Rochambeau. As commander of the French forces sent to join the Continental Army in 1780, Rochambeau played a key role in the pivotal October 1781 victory at Yorktown against the British under Lord Cornwallis. Rochambeau visited Mount Vernon briefly, en route to Yorktown in September 1781, and he corresponded extensively with Washington after his return to France in January 1783. Unfortunately there are no documentary references to a gift of a painting. Claudian landscapes were highly popular in 18th century Virginia gentry households and were represented at Mount Vernon by another oil painting, acquired by Washington in 1757 and hung over the fireplace in the Front Parlor, and numerous engravings, acquired in 1797 and displayed in gilt frames, hung throughout the house. 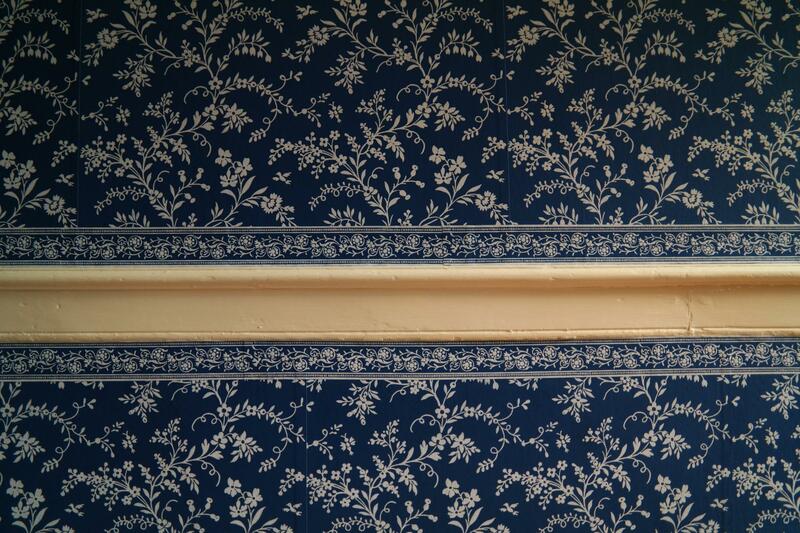 Reproduction of original New Room wallpaper border, MVLA. 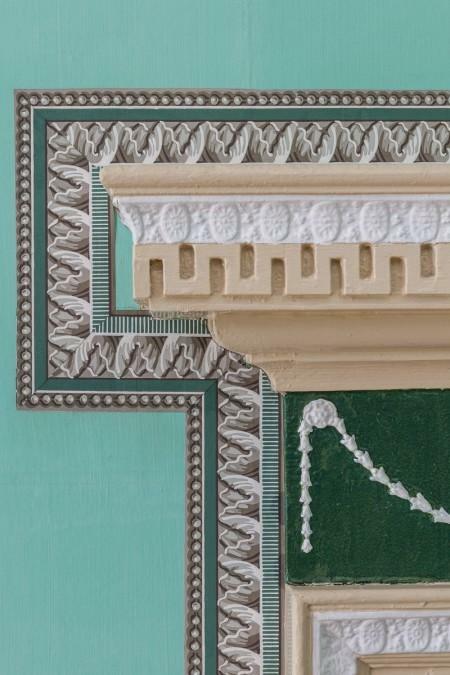 The verditer-green painted wallpaper and accompanying neoclassical border return the New Room’s walls to their appearance during Washington’s retirement from the presidency, based on evidence provided by surviving wallpaper fragments, paint analysis, and documentary references. The border design is based on several fragments found in the room during early restoration campaigns. Although none of these fragments contains the complete border, the original design was located in 2011 by Véronique de La Hougue, Curator in Chief at the Department of Wallpapers, Musée des Arts Décoratifs, Paris, in a 1780s catalogue of wallpapers issued by the firm of Jean-Baptiste Réveillon, the most famous French manufacturer of wallpaper in the late 18th century (later continued by the partnership of Jacquemart et Bénard). This discovery, generously shared by our French colleague, enabled Mount Vernon to commission from Adelphi Paper Hangings an exact reproduction of the original design, a row of stylized lamb’s tongues or bellflowers flanked by beading and a delicate comb pattern. 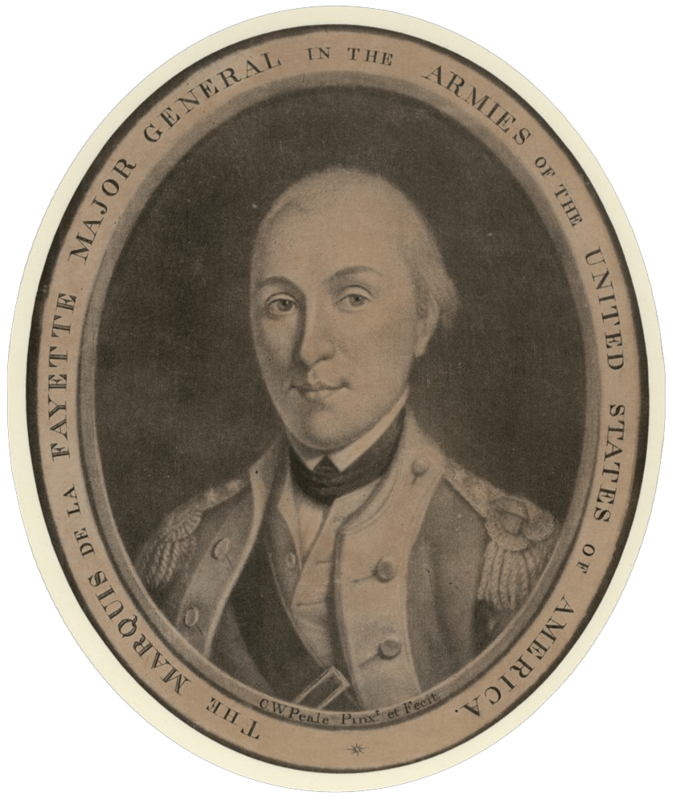 Portrait of the Marquis de Lafayette, mezzotint by Charles Willson Peale, Original engraving: Purchase, 1989 (M-2086/B). George Washington owned several portraits of the French nobleman Marie-Joseph Paul Yves Roch Gilbert du Motier, Marquis de Lafayette (1757-1834), who served as Washington’s aide de camp during the Revolutionary War and became like an adopted son to the General. One of these, a small oval mezzotint engraving, hung over the mantel in Mount Vernon’s Little Parlor, together with companion portraits of Benjamin Franklin and George Washington himself. These three portraits were part of an ambitious but short-lived effort by Peale, then the leading portraitist in America, to create a series of high-quality mezzotint engravings of leaders of the American Revolution. Since Lafayette was back in France when Peale executed the engravings in 1787, the Frenchman’s likeness was presumably based on earlier portraits that Peale had painted, including one commissioned in 1778 by George Washington. The three engravings are represented in the Little Parlor today by photographic facsimiles of the 18th-century originals. Original engraving: Purchase, 1989 (M-2086/B). 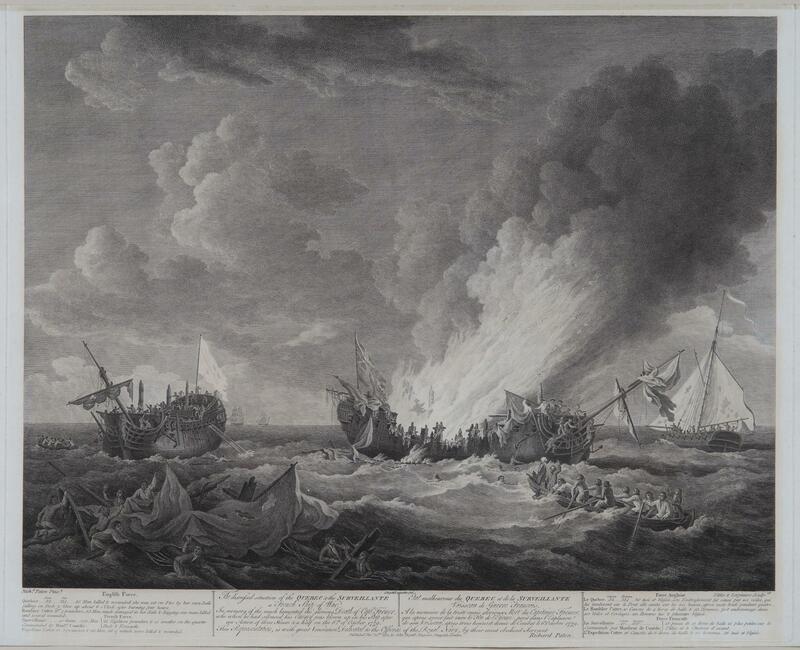 The distressed situation of the Quebec & the Surveillante, a French Ship of War, engraving by Daniel Lerpinière (published in London, 1780). Collection of R.T.H.Halsey. Purchase, 1936 (M-93/t). 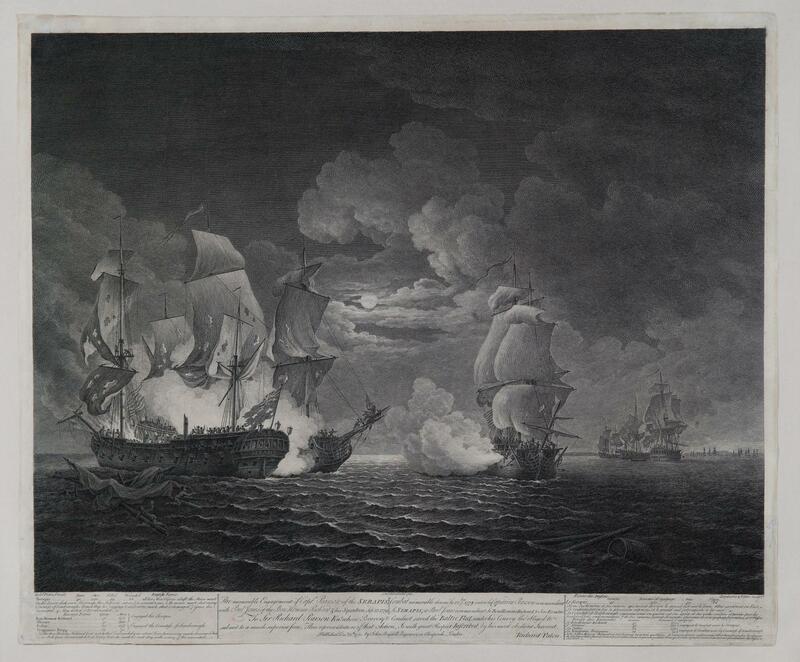 The Memorable Engagement of Capt'n Pearson of the Serapis, with Paul Jones of the Bon Homme Richard & his Squadron, Sept. 23, 1779, engraving by Daniel Lerpinière (published in London, 1781). Purchased with funds provided by Daniel K. Chandler and Neysa M. Slater-Chandler, 2011 (M-5261). Both prints were engraved in London by Daniel Lerpinière (1745?-1785), probably of French Huguenot descent. Original print and frame: Louis Seize, Roi des Français, Restaurateur de la Liberté, engraved by Charles-Clément Bervic (1856-1822), after a painting by Antoine-François Callet (published in Paris, 1790. Purchase, 1939 (W-767/A-B). One of the grandest items in the New Room was an engraved state portrait of King Louis XVI of France in an elaborate gilt frame. Like much of the artwork in the room, this item was one that Washington brought back from his executive residence in Philadelphia. He had received it in December 1791, as an official diplomatic gift, presented by the new French minister, Jean-Baptiste, chevalier de Ternant (1751-1816). Ternant brought with him 20 impressions of the engraving, which he presented to members of the U.S. government. 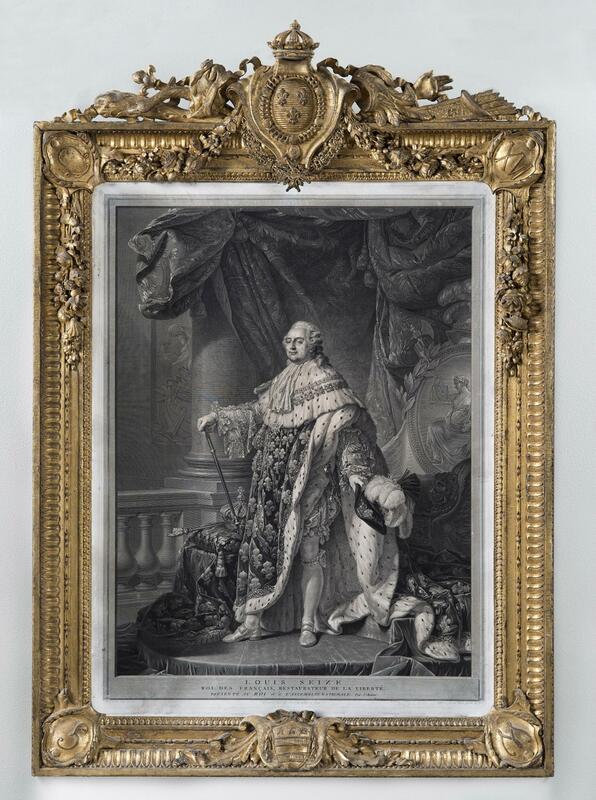 The print depicted King Louis (1754-1793) as he appeared in his coronation regalia in 1779, painted by his official portraitist, Antoine-François Callet (1741-1823); the engraving, by Charles-Clément Bervic (1756-1822) won praise from critics as the best reproductive engraving of its day. The frame is equally splendid: a “palace” style frame, custom-designed for presentation to Washington. It features his coat of arms at the center bottom and the initials “G” and “W” at the lower corners; the top corners display the King’s monogram, “L” and “XVI”, flanking the Bourbon arms, a crown, a Native American headdress and the French cap of liberty. This juxtaposition of the symbols of the two nations and their leaders emphasized the exceptional bond of friendship between France and the United States, established by their alliance in the American Revolutionary War. 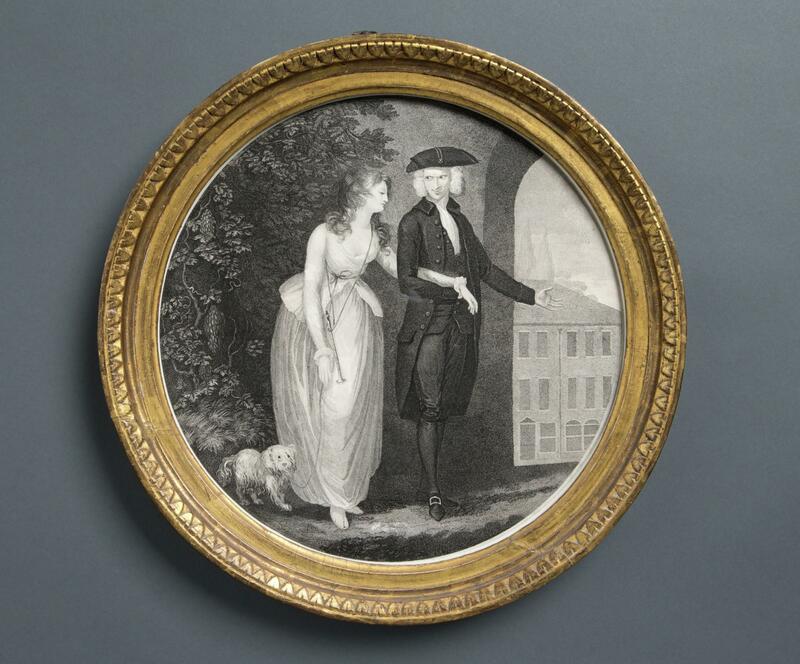 The original print and frame remained in the Washington family until acquired by Mount Vernon in 1939. They are carefully preserved and represented in the Mansion by an 18th-century example of the print housed in a modern frame copied from the original. Original print and frame: Louis Seize, Roi des Français, Restaurateur de la Liberté, engraved by Charles-Clément Bervic (1756-1822), after a painting by Antoine-François Callet (published in Paris, 1790. Purchase, 1939 (W-767/A-B). Bisque porcelain figural groups of Venus and Cupid with Garland and Venus and Cupid with Torch, made by Locré et Russinger, Paris, c. 1785. Purchased with funds provided by David W. Dangremond and collections funds, 2013 (M-5332). Bisque porcelain figural groups of Venus and Cupid with Garland and Venus and Cupid with Torch, made by Locré et Russinger, Paris, c. 1785. Purchased with funds provided by David W. Dangremond and collections funds, 2013 (M-5333). As Washington was setting up his presidential residence in New York City in the summer of 1789, he gave serious consideration to the proper accoutrements for his dining table, which he recognized would play a subtle but influential role in establishing the reputation of the new republic. Writing to Gouverneur Morris (1752-1816) in Paris, he asked the Philadelphia financier to assist him by acquiring a “surtout”—a set of porcelain figures plus a large mirrored tray on which to display them. Such elaborate centerpieces had been popular among French nobility and at the royal court since the mid-18th century, using figures made first of sugar paste, and then white porcelain, often arranged in elaborate scenes. Morris sent Washington 15 classical figures and 2 vases, all made of unglazed white “biscuit” porcelain, produced at the manufactory of the Duc d’Angoulême, which, according to Morris, was less expensive but just as high-quality as the more prominent Sèvres porcelains. 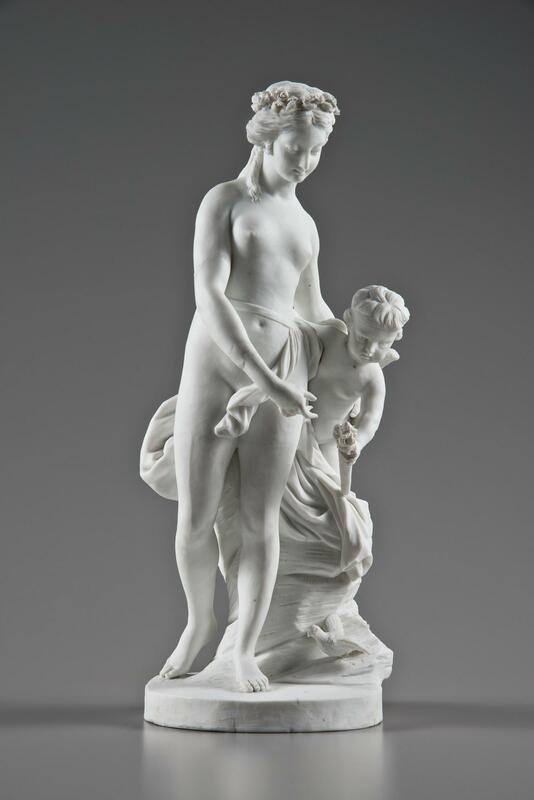 The matte white surface of the biscuit porcelain resembled marble, making these figures miniature versions of classical statuary. Washington’s set represented popular gods and goddesses in Roman mythology, including the Apollo (god of the sun), Cupid (god of desire), Venus (goddess of love), Minerva (goddess of wisdom), and Flora (goddess of spring). Such figures visually communicated shared aspirations to the republican principles of the ancient world, and guests at Washington’s weekly dinners for government officials and foreign emissaries commented approvingly on the display. 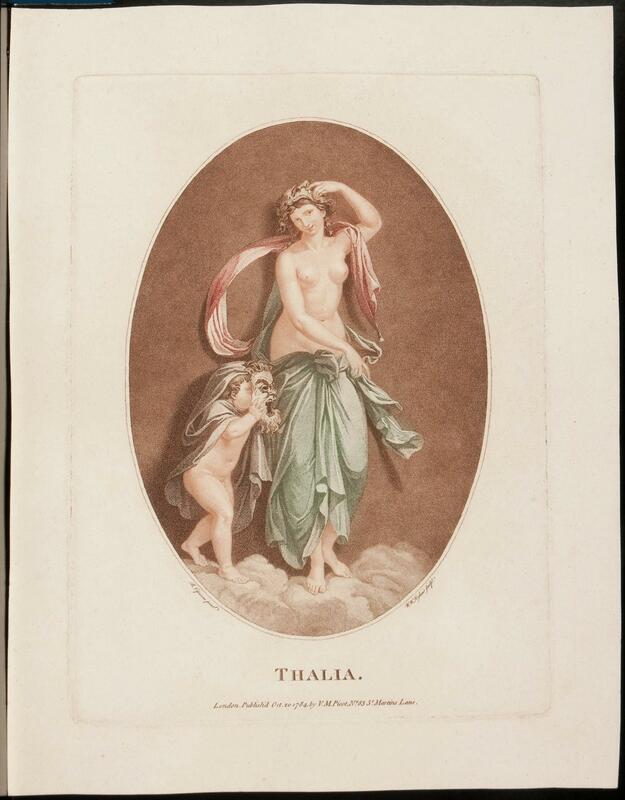 Stipple engravings, Thalia and Urania (published London, 1784). Purchase, 2013 (M-5328). Stipple engravings, Thalia and Urania (published London, 1784). Purchase, 2013 (M-5329). The New Room’s artwork includes four small oval prints depicting mythological subjects. These were part of the large group of prints that George Washington purchased in 1797, at the end of the presidency, in preparation for updating the furnishing of Mount Vernon for his retirement. Two of these elegant images were part of a series published in London by the French printmaker Victor Marie Picot (1744-1805). The locations of Washington’s original prints are unknown; they are represented by two 18th-century prints from the series, Thalia and Urania (the muses of comedy and astronomy), displayed on the outer sides of the two large neoclassical looking glasses. 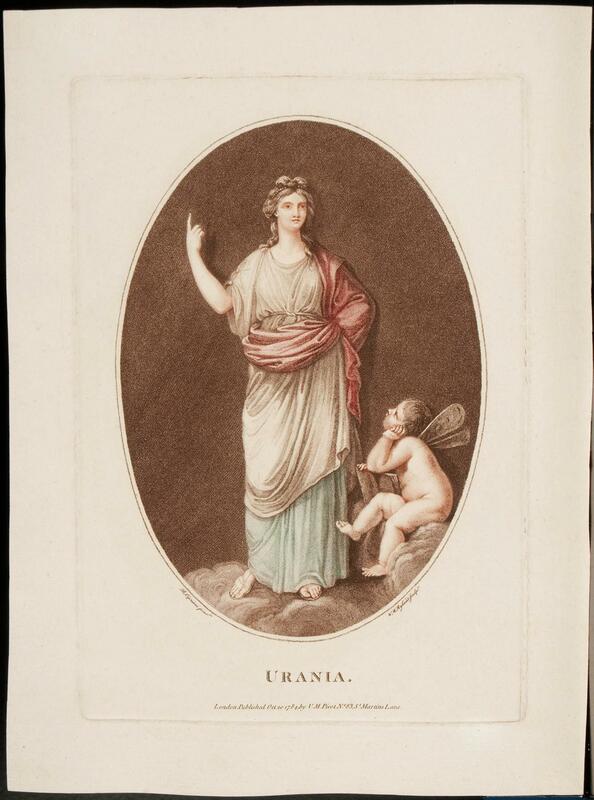 Stipple engravings, Thalia and Urania (published London, 1784). Purchase, 2013 (M-5328, M-5329). Original looking glass, probably Paris, c. 1788. Purchase, 1939 (W-28). French minister, Éléonor-François-Elie, the Comte du Moustier (1751-1817), who had been recalled to Paris by the French government. The purchase included two large gilt-framed looking glasses, a suite of upholstered chairs and sofa, a writing desk for Mrs. Washington, a dressing table for the president, more than 300 pieces of Sèvres porcelain dinnerware, and many other items both practical and luxurious. The looking glasses were among the most expensive items that Washington purchased from the French minister and they hung in the state dining room of the president’s house in Philadelphia, before being sent home to Mount Vernon. One of the two original looking glasses hangs on the river side of the New Room today, accompanied by one of two original mahogany sideboards (made in Philadelphia) and two original silver-plated Argand oil lamps (probably from England). 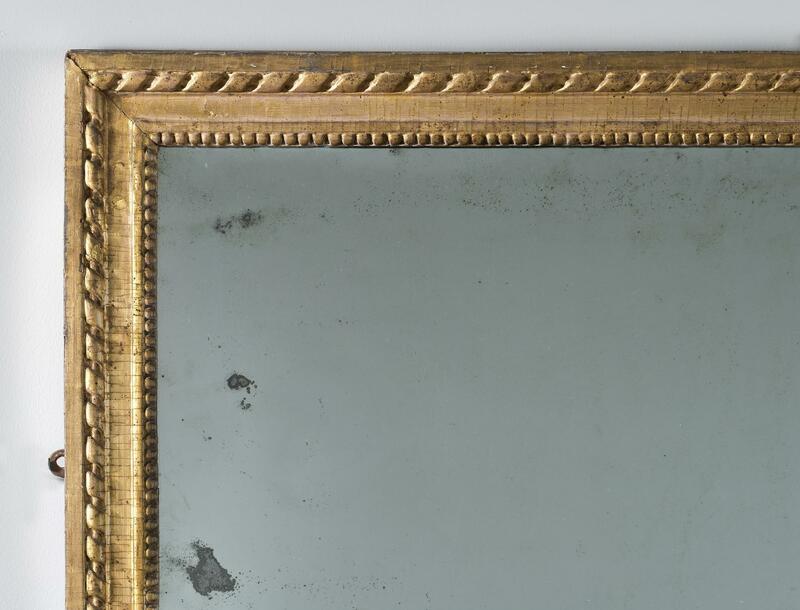 The looking glass’s simple geometric shape and narrow gilt molding exemplifies the austere neoclassical style popular in late 18th-century France and highly desirable in federal America, where French goods were in great demand. The most impressive aspect of this looking glass is its towering height of 81 inches; in the 18th century only France possessed the technology to produce plate glass of this size. Given their rarity and cost, such large mirrors signaled both wealth and power, evoking (on a smaller scale) the magnificence of King Louis XIV late 17th-century Hall of Mirrors at Versailles. The history of Washington’s looking glass, from the official representative of the French state, to the president’s house, to Mount Vernon, certainly connects it directly to that legacy of power and awe. After Martha Washington’s death, the two original looking glasses passed into the families of her granddaughters, Martha Parke Custis Peter (1777-1854) and Eleanor (Nelly) Parke Custis Lewis (1779-1852); the first returned to Mount Vernon and the other is in the collection of the Smithsonian Institution, National Museum of American History. The second looking glass displayed in the New Room is a 20th-century copy of the original. Argand lamp, c. 1790, Gift of Sarah Howard Caldwell, 1959 (W-12/A-B). 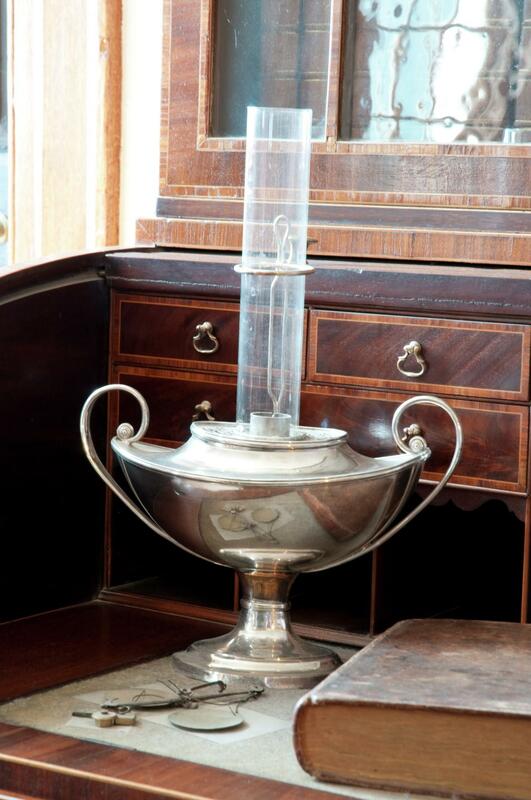 The Argand lamp – the first major improvement in lighting technology since ancient times – was devised by Swiss chemist François-Pierre Ami Argand (1750-1803), who was active in Paris in the early 1780s. A hollow woven wick increased oxygen to the flame, producing a brighter light (between six to ten times that of a single candle) with less fuel, smoke, and fumes. Ever a lover of technological innovation, George Washington in March 1790 wrote to Philadelphia financier Gouverneur Morris, then in Paris, to request a supply of the new, oil-burning lamps for the president’s house. The elegant original lamp displayed on Washington’s secretary is one of 26 Argand lamps procured by Morris for Washington in 1790. Washington eventually acquired, using his personal funds, a total of 43 Argand lamps – including the two wall mounted examples seen on the river side of the New Room. Additionally, four elegant silver-plated wall lamps that were purchased in 1792 from Philadelphia silversmith Joseph Anthony and installed in the Green Drawing Room of the president’s house. Two of the original wall lamps survived in the family of Martha Washington’s granddaughter, Eleanor (Nelly) Parke Custis and returned to Mount Vernon in 1893. They are displayed on either side of the original looking glass on the river side of the Dining Room, as they were listed in George Washington’s 1799 inventory. The two lamps at the other end of the room are modern reproductions. The urn-shaped oil reservoir echoed forms and ornamentation found on ancient Greek and Roman vessels, while the silver-plated copper represented the latest metalworking technology. These lamps thus offered visitors to the president’s house and later Mount Vernon a pleasing reference to republican taste, classical ideals, and modern innovation. 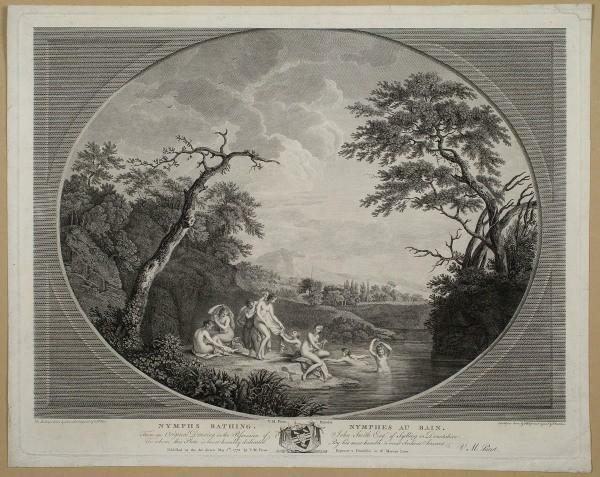 Nymphs Bathing, Gift from the Jess and Grace Pavey Fund, 2013 (M-5310). The Storm, Gift from the Jess and Grace Pavey Fund, 2013 (M-5311). Two of the gilt-framed prints in the Blue Room depict river scenes with groups of classically draped females: Nymphs Bathing (over the mantel) and The Storm (on the wall near the door). The originals of these images were published in London in 1773 by the French printmaker Victor Marie Picot, and they were acquired as part of the large group of prints that George Washington purchased in 1797, at the end of the presidency, in preparation for updating the furnishing of Mount Vernon for his retirement. The original prints are represented today by photographic facsimiles. Since George Washington, the United States has had a special relationship with France.